From a personal perspective, I’m a fan of Pinterest. From a business perspective, I am a HUGE fan of Pinterest. Why? Well the stats are staggering on how much the site, while still in beta, has grown to the point where it drives more referring traffic than Google+, YouTube, and LinkedIn combined! Pinterest is becoming an increasingly important tactic for all of the social media strategist of ecommerce sites and retail brands. 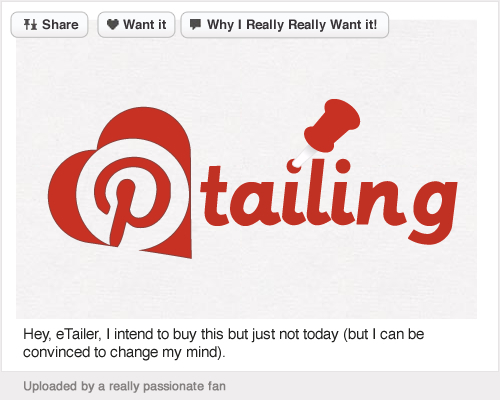 To understand the success of Pinterest you have to understand the psychology behind the act of “pinning”. Pinning is a declaration. A declaration that the Pinned image (ergo the object(s) in the image) is worth sharing. It could simply be beautiful photograph or work of art but most of what you’ll find are objects of desire. When Pinners create Boards (collections of Pins) they become a collage of that pinner’s visual representation of their personal brand crafted (intentionally or subliminally) for public consumption. Public, mind you. Not just for friends. Pinners are curators of whatever they deem shareable. There’s even a gaming mechanic the comes in the reward of having their Pin “repinned” by as many people as possible. Repinning is not exactly a follow of Twitter and it’s far from the Friend on Facebook. It’s more like a hat-tip to say thanks for sharing. Eventually, the hat-tips become follows of a pinner’s board or entire collection of Boards. Because the act of Pinning and Repinning is so effortless and visually driven it becomes in some ways more of an act of lust rather than a gesture of love or even a “Like”. But that’s the secret sauce of Pinterest – we as marketers can turn that lust into sales and brand equity. There are many adjectives that can explain reasons behind a Pin such as “cool”, “interesting”, “amazing” but I’m more interested in one verb – “Want”. It’s easy for eTailers to be fooled by the visceral, lustful and even passionate act of thousands of Pins as a love of the brand. It’s not. It’s a collective of individuals declarations of “Want” of the brand’s object. Remember, they’re going by visuals alone. The difference between converting a Pin to a one-off sale versus converting the Pinner to a lifelong customer is still driven by the immutable laws of branding. Lust, love or like, the act of Pinning speaks volumes on purchase intent. And it’s because of this, that Pinterest is a game changer for eTailer and retail brands. Our challenge create catalyst that drive conversion in their moment of attraction. So in the end Pinterest is going to be force to be reckoned with. What do you do? Pinterest does not yet have any kind of advertising model that we as marketers can leverage to reach our target audience. So how do you turn a Pin into a win? Here are just a few quick ideas to get the Pinning started. This may seem obvious, but invite visitors to follow you by adding a Pinterest button on your site. Sign up for PinReach to discover, follow and engage Pinterest influencers in your category. In the Pinterest search box, type in the word “Want” and your brand/product and follow those who have mentioned you then repin their Pins. For example, type in “Want Victoria’s Secret” and you’ll see a cavalcade of Pins. Reward your frequent Pinners. To find them, type http://pinterest.com/source/YourDomain to see who your most passionate Pinners are and reward them in them in a big and very public way. Promote your Pinterest campaign across all channels. Turn Pinterest into a powerful branding and PR tool. Make your site Pinterest friendly by peppering it with imagery that is “Pinteresting”. Invest in photography, create stunning visuals, get creative with your product shots but think about what that image will look like as a 200×200 pixels. Most importantly, be sure the images are recognizable by Pinterest. Flash content, for example, is a no go. Look what happened when I tried to Pin the Nike+ Fuelband! Yes product shots should be beautiful but why not create a what I call a “Pin Farm”? What’s a Pin Farm? It’s an easily browsable gallery of photos of really Pinteresting shots with your products featured in them. Design the page(s) to drive Pins. Five word, keyword rich captions and an easy way to convert to a sale. Don’t forget about Pinterest’s mobile app! Put some “Pin This” calls to action on your displays and encourage real-life pins. Better yet, use QR code to drive to the Pinterest page of the real life object and ask for the Pin. Organize your Pinterest Boards to align with your product categories. If they don’t align with what is organically happening on Pinterest, you may want to rethink your site’s information architecture. As people browse your brand’s Pinterest page, they should be able to find accessories for example, as quickly and easily as they would on your site. Be sure to put a “$” and price for your Pinned products. It will show up under the “Gifts” tab and SCREAMS “buy me” in the process. You can leverage Pinterest to drive traffic to your site if you optimize your Pinterest brand page for image search. Here’s a great post I found on Google+ with nice tips. Along with your Like, +1 and Tweet buttons on each product on your eCommerce site, be sure to add your “Pin This” button. If your in the fashion arena, I highly recommend Pose.com. It went live around the time of Pinterest and has a eerily similar user interface. The main difference is this is consumer generated content where “Posers” snap photos of themselves wearing their favorite fashions then post to Pose for peer review. Follow the influencers including Rachel Zoe and engage. Heck, might as well Pin your Poses!